Entering the middle school cafeteria, I recognize the taupe and marigold paint scheme and find an old wooden stage with faded velvet curtains and an American flag with a gilded eagle perched atop. The sight rekindles memories of pep rallies, my first dance and first awkward kiss—on the forehead—but the decor might be all that has remained the same since that last time I stepped foot in a school cafeteria. The room doesn’t smell anything like mystery meat, warm plastic trays or bleach. Through the kitchen pass I notice the chefs prepping large bowls of greens and chopping mirepoix for sauce. Produce is brought in weekly from local farms. On any given day, the “Hot Lunch Special” might feature locally sourced proteins like grass-fed beef or wild-caught fish. OK, hold on. Take a sip of your Pamplemousse spritzer, it might help you digest all this. You just read the words salad bar, local Satsumas, emmer farro, local grass-fed beef, chefs and mirepoix. This is not the daily chef ’s menu for that new forward-thinking, plant-based, locally driven, farm-to-fork, conscientiously contemporary eats boutique on the corner of Hip and Skinny. No, this is not Chez Quinoa or Beets & Barrels. This is SLO’s own Laguna Middle School and something delicious is happening. If adults have high standards for healthy whole-food options and look to local growers to provide sustenance, shouldn’t these foods be available to school children as well? Former First Lady Michelle Obama thought so. Driven by her desire to help curtail the rising rates of childhood obesity in America, in 2010 the First Lady helped champion the Healthy, Hunger-Free Kids (HHFK) Act, which was, in a nutshell, designed to ensure that meals served in school cafeterias were held to specific nutritional and portion standards. For example, schools can still serve hamburgers and pizza but the recipes need to include more whole-food ingredients like whole grains and actual tomatoes in the pizza sauce. Also, a serving of fresh fruit or vegetables is required to round out each portion. 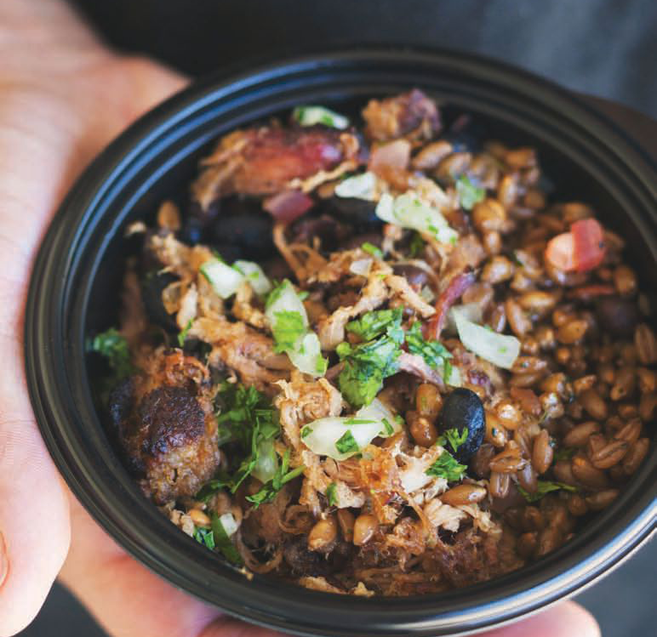 But, as anyone who has eaten at Chez Quinoa or Beets & Barrels can tell you, the food might be tasty and beneficial to gut flora, but the numbers can run high for small batch, locally sourced, organic, market-driven, plant-based and grass-fed cuisine. When dealing with a school lunch program, literally every cent of food cost matters, and using locally sourced ingredients does raise the cost per unit. This means that fixed costs, like labor, do not go up just because cafeteria chefs start cooking something from scratch. “Purchasing microwavable burritos costs more than doing it in-house, and you’re already paying the labor costs so while it’s just slightly more difficult, it’s not more expensive,” she says. “As a matter of fact, we will lose two-thirds less this year than we lost last year.” Bottom line, purchasing from the local foodshed filters money directly back into our local food economy rather than feeding national and even global markets. To offset the cost of purchasing locally sourced proteins such as grass-fed beef, with help from Nutrition for the Future, Inc., in Billings, Montana, and local collaborators like Daniel Sinton of Avenales Cattle Co., USDA processor J&R Natural Meats and Sausage, as well as my company, the Larder Meat Co. of San Luis Obispo, Primer has formed a veritable meaty dream team to curate and create a burger patty made of local beef and diced mushrooms. Leveraging a creative trick from the fast-food industry, Primer uses inexpensive mushrooms processed into the ground beef to bulk the burger patties. By including mushrooms, Primer can afford to serve burgers made from locally sourced beef. (And who doesn’t love a good ’shroom burger?) Primer has also incorporated this technique into meatballs and has plans for many other recipes to serve this school year. It’s local, cheap, nutritious and—best of all—the kids love it. OK, so students eat hamburgers and burrito bowls: Nothing new here, right? But if students are required to add a fruit or vegetable portion to their hot lunch, will they even eat it or will schoolyard trashcans become glorified composting bins for locally grown produce? Any opinionated foodie worth their salt might call this the “uneducated palate” argument. But at Laguna Middle School, kids are not only eating their greens— they are enjoying them. In addition to anecdotal evidence on the Central Coast, a recent study published by the UC Berkeley School of Public Health tracked 10 school districts to monitor their new lunch programs. Long story short, while researchers found room for improvements with systems’ integration and infrastructure, the results were overwhelmingly in favor of continuing the healthier cafeteria food initiatives (“Atkins Center Study: Students Prefer New, Healthier School Meals.” UC Berkeley School of Public Health. N.p., 21 June 2014. Web. 14 July 2017). My quick trip to Laguna Middle School only reinforces these findings. Seventh graders have swapped out french fry tacos for raw broccoli florets (they still dip them in ranch dressing, of course) and eighth graders gossip while chowing down on a salad of leafy greens and shaved cucumbers. While certain things might never change in grammar school—there’s still muted earth tones on every wall, first kisses on the forehead, undoubtedly, and kids will forever dip anything in ranch dressing—it’s clear that someone is looking out for these awkward, amazing and very intelligent young people. If this is the future of food service in public schools, then the future’s looking happy and healthy, served with a side of local market greens.